Who wouldn’t want to be Hitchin right now? Leave a Comment on Who wouldn’t want to be Hitchin right now? IT WAS ironic that in a week when the sacking of a manager made all the wrong headlines, Kings Lynn Town rolled into Hitchin after disposing of their “gaffer” in somewhat strange circumstances. However, Kings Lynn have hardly had a disastrous season, but it wasn’t good enough, apparently. Ian Culverhouse, who has acquired that all-too-often tagged title of “legend” after 300-odd games for Norwich City, was appointed in Setchell’s place. He was last seen in action at Aston Villa as assistant manager in 2014. Culverhouse has a daunting task. Kings Lynn Town is a phoenix club that arose from the ashes of the old Kings Lynn FC that was wound-up in 2010. It’s a place that craves a successful football club, but the old version was something of an under-achiever, despite good support – they are currently averaging over 500, but when the club won the Southern League in 2008, they were bringing in double that figure. How Kings Lynn would like to be in Hitchin’s position. These are happy times for the Canaries, who should finish in the top five for the second season running – the sort of stability they have lacked throughout time. In fact, if they manage it – and barring a major setback, they are on course – it will be the first time the club has achieved two successive finishes at such a high level of the non-league pyramid. Top Field archivists might look at the late 1980s when the club was in division one of the Isthmian and the early 1960s when the Canaries were members of the Athenian, but since life got more serious, the Hitchin team of 2015-2017 could establish itself as the most consistent in its lengthy history. Of course, they don’t like to talk of things like promotion, but it is a reality. “We’ve got a tough run-in,” said one long-suffering Canary, pointing to games with Leamington, Slough and Chippenham, but let’s not forget these are all at home, where Hitchin are still, amazingly, unbeaten in the league. “It’s also tough for them to come to Hitchin,” I replied. Such caution is not unknown at Hitchin. The fans are not used to the club being front-runners on such a prolonged basis – the last time they were in that position was in the 1930s and you have to go back to the 1990s for a Hitchin team that could look big names in the eye with confidence. In fact, the current Hitchin team is probably playing the best football seen at Top Field since 1993-94 when nine consecutive league wins put them among the title contenders for a brief period. Then current manager Mark Burke was injured and it fell apart. That Hitchin team, with Burke as skipper, played some delightful football and there are some comparisons with the current squad. The only difference, which Burke is constantly reminded of, is the Andy Melvin team of 1994 had some outstanding forwards in Steve Conroy, Gary Williams and Shaun Marshall. But these are different times and Burke’s team doesn’t seem to be suffering too much from the absence of a top-notch forward. They also have a tough underbelly these days which past Hitchin teams often lacked. Before facing Kings Lynn, they had travelled to Merthyr Town in midweek – a ridiculous 400-mile round-trip that arrived back in North Herts at around 3am on Wednesday morning – and secured a 2-2 draw. It’s been a couple of months since Hitchin’s colours were lowered in league action, ominously at Chippenham the leaders, and the Canaries have also reached the two county cup finals. They could do with a shade better support from the town, although the needle has definitely moved from the 350 mark to beyond 500, which is only fitting given the form Burke’s side have been in. But if promotion does come, the town has to really get behind this team. It is a team brimming with confidence. It took just two minutes for Callum Donnelly to put them ahead against Kings Lynn and then Robbie Burns added a second on 13 minutes with the always impressive Matt Lench scoring on 24. Burns almost scored again when his shot was parried by Alex Street, but another emerging star, Lucas Kirkpatrick, added a fourth two minutes from the break. When Burns scored his second on 47 minutes following an impressive run by Kane Smith, you feared for Kings Lynn’s new manager, but that’s how it ended – 5-0. 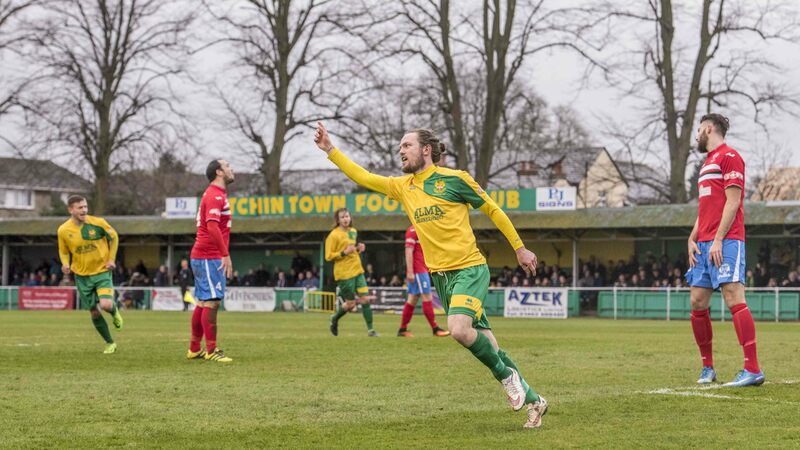 With Burns now on 20 goals, it made you wonder – have Hitchin already got their prolific front-man? If Slough, Leamington, Merthyr and Chippenham were watching, they would have gone home muttering about the size of their own tasks in the promotion run-in. This could be Hitchin’s season and there’s a good reason why success is urgently needed. How long can Burke and Adam Parker keep this side together? The hub has been in situ for a few years and they’ve grown up together. Kane Smith has already been targeted but there are others that are now looking like attractive acquisitions for more senior clubs – not necessarily Football League level, but certainly up a step or two. Promotion could fend off any suitors. The team spirit is very visibly strong at Hitchin and while Burke and Parker are there – it is unlikely that Burke, for example, would manage anywhere else, he is a Hitchin man through-and through – that will prevail. The momentum is very positive on and off the field, certainly more vibrant than it has been for some years. What Hitchin Town and Mark Burke need now is promotion or success of that magnitude. The coming weeks will be a test of their will and character, but the ability is clearly there. As a former Hitchin official that has been on the periphery for a few seasons, I cannot help but be impressed by what I see whenever I watch this exciting little team. I anticipate that step two football could well be coming to Fishponds Road in 2017-18.